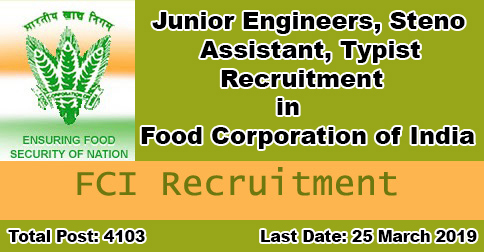 The Food Corporation of India (FCI) invites application for the 4103 Post of Junior Engineer (JE) (Civil Engineering/ Electrical Engineering/ Mechanical Engineering), Assistant Grade-II (Hindi), Typist (Hindi), Assistant Grade-III (General/ Accounts/ Technical/ Depot), Steno Grade-II and Typist (Hindi) for manning posts in its Depots and Offices spread all over the Country. Interested candidates may apply online from 23 Feb 2019 to 25 March 2019. The Food Corporation of India (FCI), one of the largest Public Sector Undertakings, dealing with food grain supply chain management. It operates through 5 zonal offices and 24 regional offices. A 11100-29950 28 Years Degree in Civil Engineering or Diploma in Civil Engineering with one year experience. B 11100-29950 28 Years Degree in Electrical Engineering Or Mechanical Engineering or Diploma in Electrical Engineering Or Mechanical Engineering with one year experience in the case of Diploma holders only. E 9300 –22940 25 Years (1) Graduation or equivalent. F 9300 –22940 27 Years Graduate Degree in any discipline from a recognized University with proficiency in the use of computers. G 9300 –22940 27 Years Bachelor of Commerce from a recognized University with proficiency in the use of computers. H 9300 –22940 27 Years 1. B.Sc. in Agriculture from a recognized University. I 9300 –22940 27 Years Graduate Degree in any discipline from a recognized University with proficiency in the use of computers. A CANDIDATE CAN APPLY IN ANY ONE ZONE ONLY i.e. EITHER NORTH ZONE OR SOUTH ZONE OR EAST ZONE OR WEST ZONE OR NORTHEAST ZONE. Interested and eligible candidates can apply through the official website of FCI i.e. www.fci.gov.in from 23 Feb 2019 to 25 March 2019. No other mode of application will be accepted. The Candidates applying for the post (ANYONE WITHIN THE ZONE) are required to submit APPLICATION FEE of Rs.500/- (Excluding bank charges but including G S T). SC / ST / PwBD / Serving Defence Personnel / Ex-Serviceman and Women candidates are exempted from payment of Application Fee. Selection of the candidates will be based on Online Test and Skill Test. Complete Exam Pattern and Syllabus is given in the official notification below. Help us to improve this article/job posting "4103 JE, Steno, Assistant & Typist Vacancies in FCI 2019". We would be glad if you can comment below and provide your valuable suggestions and feedback. If this page have any wrong information/list or out of context content, then you can report us as well. I did shorthand in Hindi , and also did a work of typist in Rishikesh court .